Are Chinese Ready to Rent? In 2010 “House price” ranked third on the list of the top 10 most popular phrases used by Chinese netizens. It came to no one's surprise. In most Chinese cities housing prices have increased significantly over the past decade, with an especially sharp rise over the past three years. “House Price” is a term used loosely, due to the fact that the vast majority of Chinese real estate is made up of apartments or condominiums, while only a small few are town houses or fully detached homes. However, terminology aside, owning a property is the greatest life-goal for most Chinese citizens. It is worth mentioning that in China property ownership does not mean land ownership as it does in the West. According to Chinese law, what people are buying is similar to a land-use right, which in the case of residential property, expires after 70 years (40 years for commercial property). The countdown begins on the date that the real estate developer signs for the land, and not on the homeowner’s date of purchase. So why do Chinese people have such zest for real estate? Prior to the 1980s, people still followed the custom of living with their parents after getting married. It was not uncommon to see a three-generation family living together in a single home. At that time renting was unheard of, as most apartments, if needed, were provided for free to a person or family by their employer, typically a state-owned entity. With China's transformation from a strictly planned economy to a market economy, many state-owned companies became limited companies which restricted free housing provision. However, employees were given the option of buying their current residences at a very low price, and most people did. Increasingly today, when a young couple gets married , both sets of parents make their utmost effort to help their children purchase a home. For many young people who do not live in their original hometown, it is essential that they buy a property in the city where they work, as that is the easiest way for them to obtain a local hukou (urban residence permit). Without this, they cannot enjoy the same rights and social benefits as the locals. People in China refer to the demand from young couples as “rigid demand,” meaning they must bear the social pressure to purchase a house before they can get married. For middle-aged Chinese, buying a house is seen as a relatively simple and secure investment, because as indicated in Figure 1, housing prices have increased steadily over the past decade. 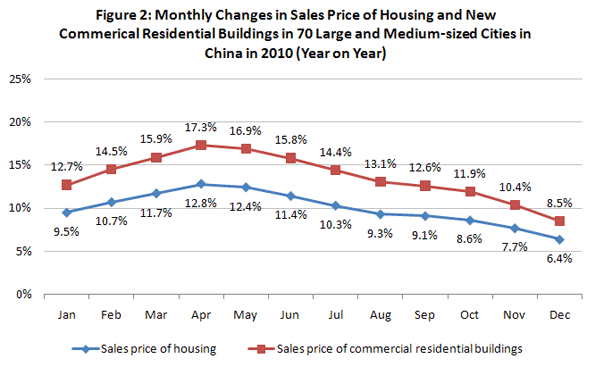 This may now be getting out hand and the Chinese government has identified housing prices as a serious national issue. 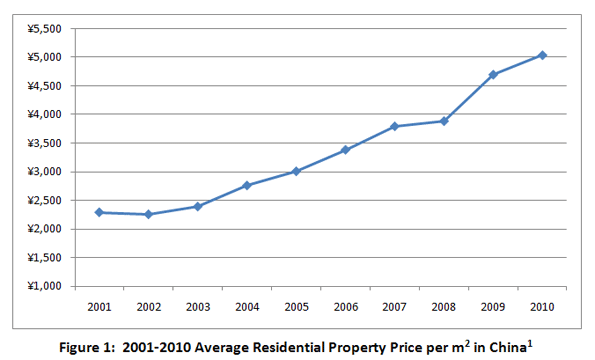 Some macro restrictive policies on home buying were issued in April 2010. Figures issued by the National Statistical Bureau, Figure 2, prove these restrictive policies did relieve somewhat the rate of house price increase. Immediately following the New Year, the Chinese central government announced that its top priority for 2011 would be controlling inflation. Shortly afterwards, a more stringent policy designed to limit speculation was issued on January 26th, 2011. Subsequently, each city issued its own policies based on this, with Shanghai and Chongqing, two Zhixiashi (provincial level municipalities administrated directly under the central government) taking the lead. Shanghai issued the following policies on February 1st, 2011. Any household purchasing a second home must provide a 60% down payment on a mortgage; and the interest rate on the mortgage will be 110% of the benchmark rate. From the publication date of this policy, households who already own one house will only be allowed to purchase one additional home. From the publication date of this policy, households who already own two or more houses will not be allowed to purchase any additional homes. Individuals selling a home less than five years since the date of purchase will be charged an additional sales tax of 5.5% of the full sales price. Many more cities followed in step, and announced their own sets of policies in the following weeks. Only one month after these policies came into effect, it is difficult to determine their effectiveness as house prices are still increasing compared with last year, although rate of change has dropped. The steady price has led to a renewal of interest in rented public housing. Chongqing became the first city to respond to the central government’s call with plans to build 40 million square meters in public-rent housing units, which will provide accommodation to 1-2 million people within the next three years and to 800,000 families by 2015. In total, Chongqing will invest 120 billion RMB (18.3 billion USD) on public-rent housing construction. 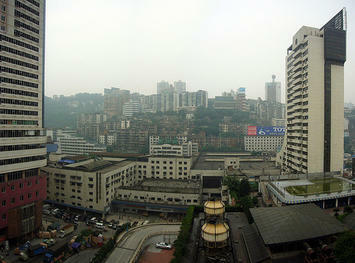 By 2012, Chongqing will also grant the urban hukou to 3 million farmers (10 million by 2020) with rural Hukou. In exchange, these farmers will give up their agricultural land, most of which will be developed into public-rent apartments. Who will be eligible to apply for public-rent housing? Applicants must have a job which provides steady income. Families must not already have housing or have housing in which the average space per family member is lower than 13m2. One thing worth pointing out is that there is no hukou limit for public-rent housing applications, which means that citizens from other cities are equally qualified. All eligible applications will be placed into a lottery and public-rent apartment allocations will go to the lottery winners. These public-rent apartments range from 39m2 or 420 square feet (1 bedroom, 1 living room) to 53 m2 or 570 square feet (2 bedrooms, 1 living room) with the corresponding monthly rent around 390 to 530 RMB (59 to 81 USD). When you consider that the current average price of residential property per square meter in Chongqing is 5700 RMB (868 USD), that means a person could rent a 53 m2 apartment for 47.5 years before paying the equivalent cost of purchasing an apartment of the same size. Following suit, many other cities in China have also started to construct public-rent apartments. Are all the problems solved? Certainly this can help most lower-income citizens to find a place to live, but there are other problems. Tenants in China are not protected by laws that uphold renter’s rights as in the west. This is largely due to the fact that there are few apartment buildings owned by a single company or person. Citizens can only rent directly from home-owners with virtually no regulatory controls over the personal renting market. Long-term leasing contracts are nearly impossible to negotiate, and landlords are able to demand large increases in rent, or even eviction at a whim. This means that renters have no stability, and usually have to face the difficulty of moving frequently. More buildings designed specifically for renting, and regulations protecting both tenants and home-owners are desperately needed. China has a long way to go when it comes to providing accommodation for its 1.3 billion citizens. Although one clear problem lies with the resources to construct the ”hardware”, this country’s development cannot continue without also upgrading its “software”: people’s way of thinking. In this case, that means convincing people to accept the idea of renting, reversing centuries of preference for ownership. Lisa Gu is a 26-year old Chinese national. She grew up in Yangzhou (Jiangsu) and lives and works in Nanjing (Jiangsu). Submitted by david watson on Sun, 05/17/2015 - 11:54. Submitted by siya23 on Sat, 05/23/2015 - 01:34. Submitted by david watson on Fri, 05/15/2015 - 01:56. Submitted by mobi on Thu, 05/14/2015 - 02:15. Submitted by xijozx1122 on Sun, 05/10/2015 - 04:34. Submitted by david watson on Thu, 05/07/2015 - 04:12. Submitted by johnz308 on Wed, 05/06/2015 - 00:30. Submitted by xijozx1122 on Thu, 04/30/2015 - 07:24. Submitted by xijozx1122 on Wed, 04/29/2015 - 04:12. Submitted by johnz308 on Fri, 04/24/2015 - 09:55. Is China About to Decentralize?